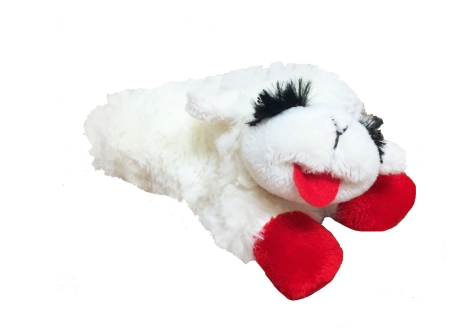 Multipet’s Lamb Chop is inspired by Shari Lewis’s well-known Lamb Chop sock puppet. Shari Lewis was an American ventriloquist and puppeteer who’s career stretched from the 1950’s to the 1990’s before her passing. She toured around doing acts and other shows for many years before her own show took off in the early 90’s. She became best known as the first puppeteer of Lamb Chop! Shari and Lamb Chop had their own show called Lamb Chop’s Play Along that began in 1992. The show won five Emmy Awards in a row! Lamb Chop also appeared briefly on another of Lewis’s shows, The Charlie Horse Music Pizza Show. Lamb Chop has even testified in front of Congress! Lamb Chop gave her own testimony when her and Lewis appeared in a hearing for the Children’s Television Act. Shari Lewis’s daughter, Mallory, still performs with Lamb Chop to this day to keep her mom and Lamb Chop’s legacy alive. She predominantly performs for the military. Lamb Chop is a three-star general! The titled was awarded to Lamb Chop by Lt. Gen. Tom Conant. The Multipet Lamb Chop dog toy is made with high quality polyester fibers. It has a super soft exterior make it great for doggy nuzzles and cuddles. The toy also has a squeaker inside of it giving it some extra playtime pizzazz. Lamb Chop’s popping color and soft touch may just bring it all together to make Lamb Chop your pups new favorite toy.. The Lamb Chop toy is machine washable too. Multipet is an award winning pet product company. They pride themselves on their unique designs and superior quality. They are committed to customer service and bringing as much fun as they can to their toys. Multipet also cares about giving back to the community. They have supported efforts and foundations such as breast cancer research and Support Our Troops.